In Bethlehem, 'Baba Noel' Delivers Christmas Gifts To Palestinian Children In the Holy Land, Santa doesn't come down the chimney or wait till kids are asleep to deliver presents. "Baba Noel" or Father Christmas hops out of a red van and makes house calls while they're awake. Sabri Canaan, 30, dons a Santa suit to deliver presents as Baba Noel (Father Christmas) on Christmas Eve in Bethlehem. His driver Mohammed Battah (left) briefs him on the list of children receiving gifts. In the Holy Land, Santa doesn't come down the chimney or wait for kids to fall asleep to deliver Christmas presents. He makes house calls while they're awake. It's a longstanding custom among Christians in the West Bank and Israel, as well as in neighboring Lebanon. 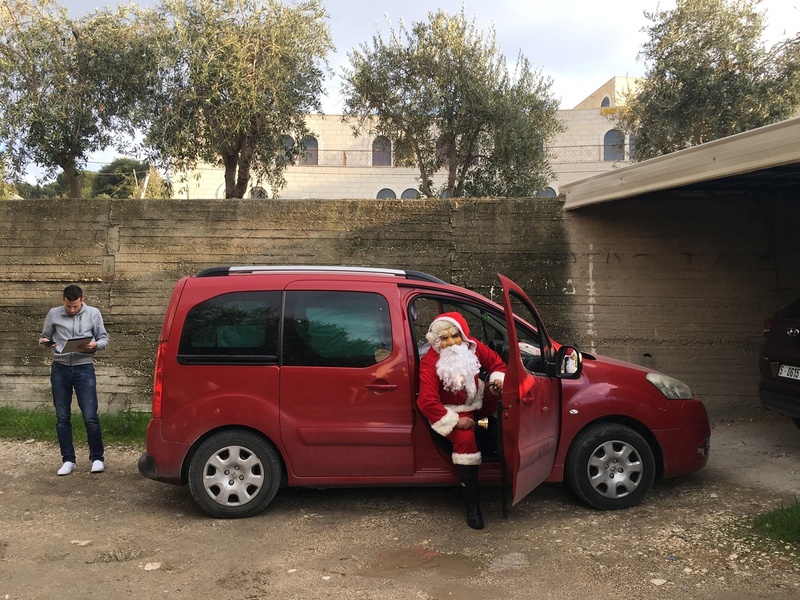 Baba Noel (Father Christmas), as Arabs call him, is driven around town to bring kids the gifts their parents bought them. Sometimes, a local Christian scouts group arranges the Santa deliveries for a small fee or a relative dons the Santa outfit. In the Israeli coastal city of Jaffa, Christian schoolteacher Vivianne Boukeleh, 43, makes Santa rounds to relatives and others — even to Muslim friends, and once to her Jewish hairdresser's home — dressed in a bearded mask and costume. She has played Santa for about 18 years. "Every year I say maybe this is my last year," Boukeleh says. "But each time the holiday arrives, I say, I have to. This is how I feel the holiday." She expressed surprise on learning this is not how Santa usually does it in the United States. Christmas is a time when the Middle East's Christian minority takes stock of its precarious status in a region where Christianity took root, but where conflict has affected many ancient Christian communities. Civil war and ISIS have ravaged Syria, but this week in Damascus, Christians paraded in the street for the holiday. In Gaza, there used to be a Christmas tree in a main square, and Santa used to go house to house delivering presents and distributing candies, says Kamel Ayyad, head of public relations at Gaza's Orthodox Church. Not anymore, since the Islamist group Hamas took control of Gaza in 2007. Now Santa greets children inside the church. In Jesus' birthplace of Bethlehem, Christians have dwindled to a minority in recent decades. Israel's separation barrier and restrictions on movement, plus a sometimes uneasy coexistence with Muslim neighbors, have led some Palestinian Christians to seek better opportunities in the West. The Santa tradition is kept alive in Bethlehem with help from a Muslim-owned toy shop called Maradona, which sends Santa to deliver the gifts its customers buy at no extra charge. The deliveries begin at 3:30 p.m. on Christmas Eve, and continue till midnight. Santa and his chauffeur do it all over again on Christmas Day, and for two more days in early January, when the city's Orthodox Christians celebrate the holiday. Sabri Canaan, the man who dons the red suit and bearded mask, is a 30-year-old Muslim. "Muslim Santa!" exclaims Maradona toy store owner Khalil Battah. "You have to know, in Bethlehem, we don't have a difference between Muslims and Christians." One Christian family that Santa visited says it has applied for American citizenship. "We're the minority. The Christians are becoming less and less in Bethlehem," says Nadine Musallam, 18. "But we are glad to be in the place where Jesus was born." The Israeli-Palestinian conflict hovers in the background: The Palestinian toy store owner doesn't have an Israeli military permit to travel to Jerusalem to his Israeli toy supplier, and the supplier is prohibited from traveling to Palestinian Bethlehem. So the two meet to hand off merchandise in a hotel parking lot in Area C of the West Bank, where Israelis and Palestinians are both allowed to visit. The tradition of Santa goes back to the 4th century, when St. Nicholas lived. A Bethlehem-area church encases the cave where believers say St. Nicholas lived for a time and gave gifts to the poor. On Christmas Eve, priest Elias Zoarob leaves that Greek Orthodox church and loads a car with bags of canned food to hand out to the needy. "Like St. Nicholas," he says. He is dressed in a black robe, not red and white. But he does have a long beard. NPR producer Abu Bakr Bashir contributed to this story in Gaza City.